– a breeding ground for mosquitos. You want to build your own pond without a natural-fed spring. TIP ~ Healthy Ponds Need Good Water Flow. 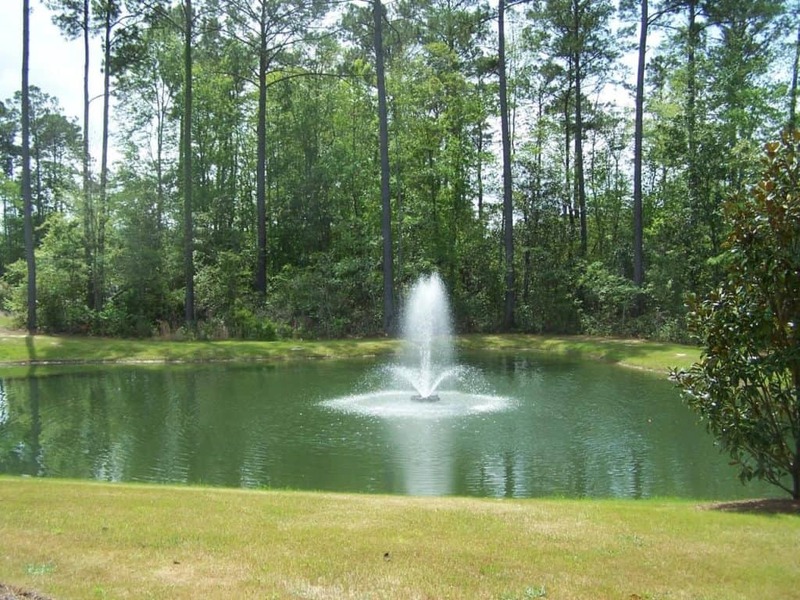 Ideally, it’s great to have a property with a spring-fed pond, or a pond that has a constant input and outlet of water year-round. If that’s not your case, take heart: Many folks have created their own ponds successfully with a little ingenuity. A solar-powered pump can not only oxygenate your pond, but also add to its beauty with a fountain of shooting water spraying into the air. In either case, whether you want to fix an unbalanced pond or create a healthy one, PROPER AERATION is of upmost importance. Let’s take a quick look why? AERATION promotes Beneficial Bacteria Growth. A healthy pond needs good bacteria to break down fish waste, debris, and decomposing organic matter. When there are not enough good bacteria present, ammonia and nitrate levels will rise. A solar pump adds oxygen so that bacteria can do their job. AERATION fosters a Good Environment for Animal Life. Solar pumps increase gas exchange at the water’s surface and circulate vital oxygen and nutrients throughout a body of water. A pond with a healthy oxygen supply will be able to sustain a fish population. Goldfish and Koi are happier with a good aeration and water filtration system. Not only that, but other animals such as frogs, newts, and birds will be attracted to your pond. AERATION Prevents Algae from Getting Out of Control. One of the main causes of algae buildup is lack of water movement. 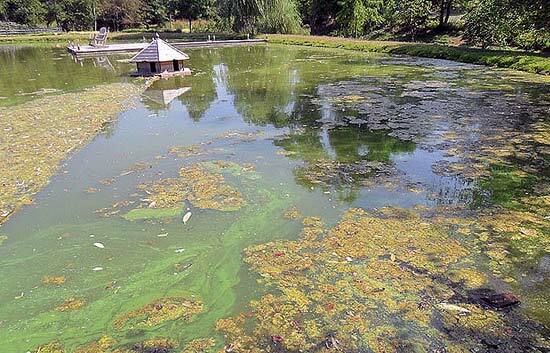 Some algae is an important part of a pond ecosystem, but too much can damage your pond. Now, it’s true that algae will give off oxygen during photosynthesis during the day. However, at night during the respiration process, it frequently uses up more oxygen than it gave off. This overall depletion of oxygen in your pond can result in fish death. Mike’s Tip: If your pond tends to have an algae problem, buy a solar panel with enough battery power to provide adequate aeration throughout the night-time hours. 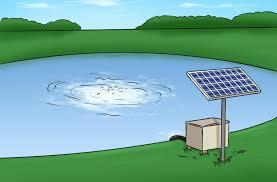 So before you start dumping a bunch of chemicals into your pond to correct an algae bloom, consider investing in a solar pump for an eco-friendly solution. Solar pumps for ponds are also just great for aesthetic purposes. I live in a picturesque spot here on the banks of the beautiful Susquehanna River, which my wife and I love- so no pond necessary. But if I did have to live somewhere else, I think I would have to get some kind of solar-powered pond or fountain set up. There’s just something peaceful and fulfilling about living near the water. Finding the perfect pump is not as hard as you may think. If you would like some more information or advice on pumps why not visit our blog “Ask Mike”. You can respond to existing discussions or ask questions in one of the chats. 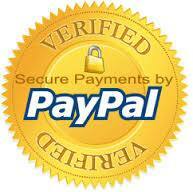 You can also contact Mike directly via email, WhatsApp and ask your question. We like to hear about issues or project challenges because as we troubleshoot for customers and make recommendations we learn and gain more helpful knowledge to share with others. Browse our catalog at US Solar Pumps. Login or checkout now if you are ready! Read our article on Home Beer Brewing!